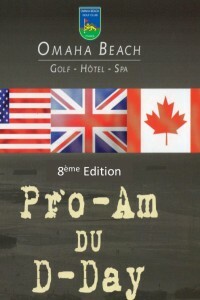 The Omaha Beach Resort, located in Normandy at Port-En-Bessin, just a few steps from the landing beaches, organises the 8th Edition of its famous D-Day Pro-Am. Besides the 72nd commemoration of the D-Day landings, that gave France liberty, democracy, and thereby the willing to start initiatives. Ever since a Golf Course has emerged, the Omaha Beach Golf Course is ensuring to promote its legacy. Besides, the Omaha Beach Resort celebrates its 30th anniversary, so we are aiming to honor the real Heroes of our History, that turn our place into a peaceful oasis of freedom and friendship considering a tremendous Sacrifice. Participating to this tournament is obviously a way to pay tribute to our History and to share the legacy left by our Heroes. Among these commemoration, the schedule includes relaxation, sports, gourmet and togetherness during three days. The Golf Tournament occures during two days of competition, on the 36th holes of La Mer and Le Manoir. Teams are melt between 3 amateurs and 1 professionnal played on “Stroke Play – Shotgun style”.